Grooming has never been easier than with the Master Grooming Tools Quick Click 4-in-1 Grooming Tool. This uniquely designed 4-in-1 tool comes with four different tool heads so you can complete four different grooming tasks with one tool. Simply click in whichever head you need to get the job done and change it up for something new. 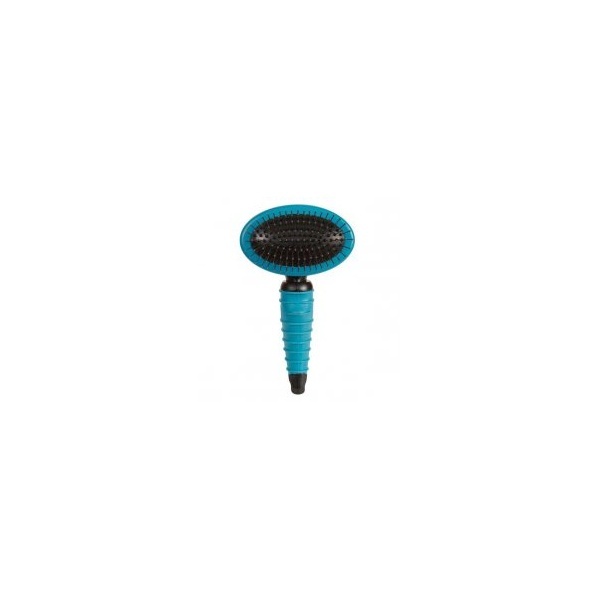 Pin Brush: Ideal for untangling longer hair, features stainless steel pins with tips for comfortable brushing of pets with sensitive skin. 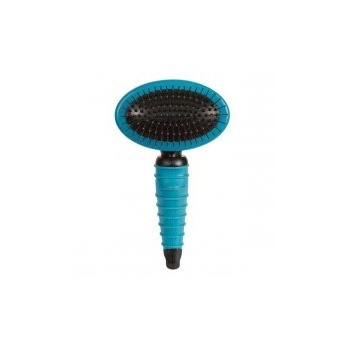 Slicker Brush: Ideal for brush-outs, mat removal and bath prep or undercoat removal; features stainless pins that are cushioned to ensure pets are brushed comfortably. Rake: Removes undercoat and loose, dead hair with speed and efficiency; features hardened steel teeth. Stripper: Strips, demats and detangles coats quickly and easily; features curved stainless steel blades with rounded edges for added safety.